I’ll be out on “tour” April 22-29 to celebrate the forty-third anniversary of Earth Day and to celebrate the publication of Trails in the Sand. At each stop, you’ll be able to enter a raffle for an exciting giveaway at the end of the tour. 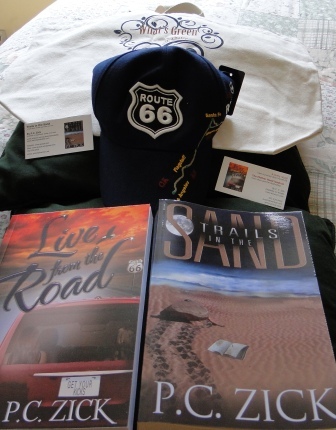 I’m giving away a package of autographed copies of both Live from the Road and Trails in the Sand, along with a Route 66 baseball cap, a Trails in the Sand magnet, all wrapped in a “green” grocery bag donated by fellow blogger Betsy Wild at What’s Green with Betsy. The bags were designed by Where Designs. The Tour Schedule – Check out these blogs and my posts and enter to win the tour giveaway. Melissa’s Mochas, Mysteries More blog features an excerpt from Trails in the Sand. Author Richard Stephenson interviews me on his blog. Bookingly Yours blog features my guest post about the anniversary of Earth Day and the connection to Trails in the Sand. Words Unlimited features my guest post on how I came to write Trails in the Sand on Back Story page. The blog Bless Their Hearts Mom will publish a review and excerpt of Trails in the Sand. Freda’s Voice features my guest post “Love Those Writers” about why I chose writers as the main characters in my books. I Read Indie blog features my guest post “Why I love sea turtles” about my first interaction with the ancient creatures and how they became a central part of the plot in Trails in the Sand. A Page Away features my guest post “Saving Sea Turtles One Nest at a Time” about my job on the team to rescue sea turtle nests during the Deepwater Horizon oil spill. BestsellerBound Recommends features an interview with me using “M” words to describe myself. Create With Joy – Live With Passion features a review of Trails in the Sand and an excerpt. Bex ‘n’ Books features Trails in the Sand. Celtic Lady’s Reviews features a review of Trails in the Sand. Confessions of an Inner Aspen features an interview with me. This entry was posted in Ramblings of a Writer, Trails in the Sand and tagged authors, blog, Deepwater Horizon oil spill, fiction, novel, Route 66, sea turtles, Trails in the Sand, writing. Bookmark the permalink. Busy, busy! Hope you have a great tour! Keeps me out of trouble. I hope so too – I’ve certainly put enough work into it. Dear God, I wish I had your energy! This is wonderful – best of luck with new followers, sales and most of all, new friends! I’m very excited about it – I’d resisted for quite a bit but now I’m in 100 percent. You’ll be busy!!! Enjoy and good luck. Hey Darlene – all the hard work is done. Now the fun part starts.